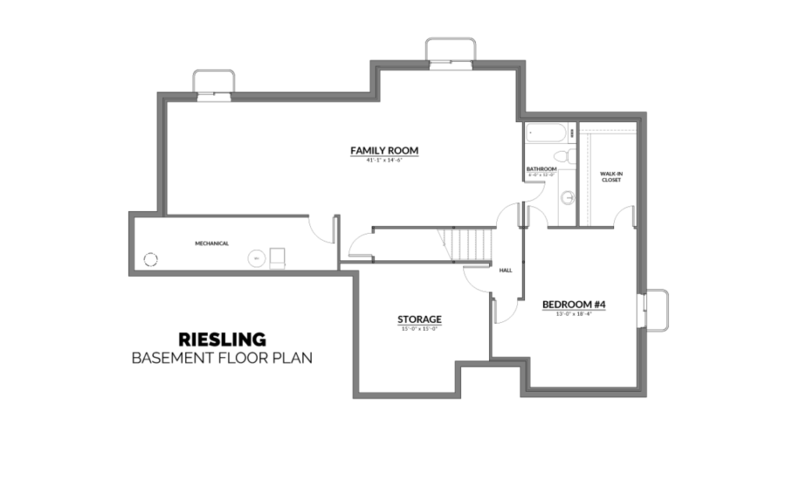 With an extensive number of elevation options on the Riesling floor plan, you can enjoy quite a few ways to give your home a custom look, starting with its curb appeal. Main floor areas feed off a central hall and foyer—including the great room (with gas fireplace and mantle and large windows), dining/kitchen, formal dining room or den, and master suite (complete with luxury 5-piece bathroom and large walk-in closet). Laundry, mudroom and powder room complete the first-floor layout. To capture additional space, you can opt to upgrade the 2-car garage to 3. Upstairs, two bedrooms and bath open off a loft area overlooking the Great Room. The loft can also be closed off for a third bedroom. The optional basement finish features an additional pair of bedrooms, large family room, bathroom and has a mechanical room offering ample storage space.